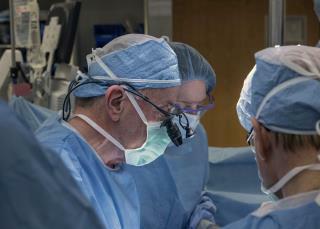 (Newser) – Surgical rooms might look like the most sterile of places on TV or in the movies, but a post at Atlas Obscura reveals a gross truth: Surgery can smell, and terribly so. The daughter of one surgeon writes that as a child she was allowed to attend a surgery but had to flee when the cauterizing blade cut through the fat, burning it. Though she found the smell nauseatingly bad, many surgeons report not just getting used to it but even finding it rather pleasant, much like "a sizzling New York strip." And that doesn't even begin to explore the smell of burning bone. Or of bile. Or rotting flesh. But still, there is one smell that might rule them all: dead bowel—surgeons sometimes have to remove a section that has died because the blood supply to it was cut off. I just cut a gasser that peeled the paint off the walls. I'm having a hard time typing because my eyes are burning. Google Image Search "Fournier's gangrene" Go ahead, I dare ya.